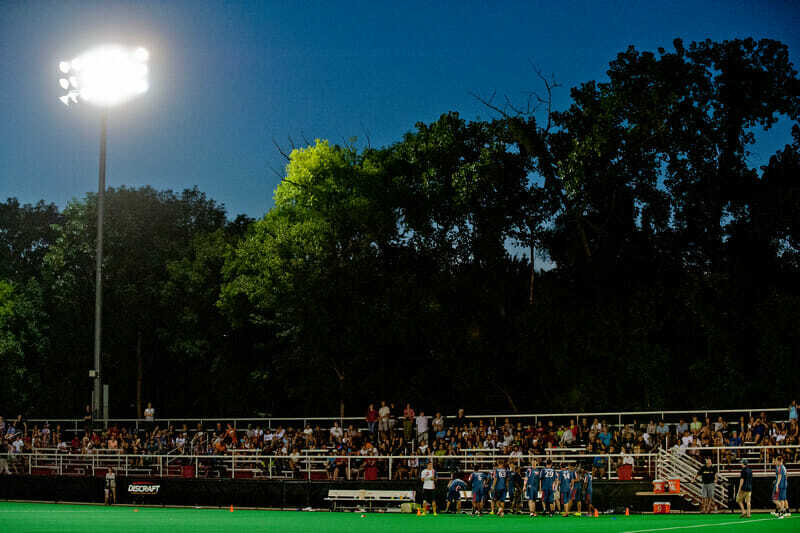 14 players from the DC Breeze’s 2018 roster and nine of 11 members of the Breeze’s Gender Equity Committee have announced that, barring changes, they will boycott the team and the AUDL in 2019. “Over the past ten months of working within the AUDL structure, league officials and owners have shown at both the local and league level that the AUDL was not interested in making gender equity a priority in 2018,” the signatories wrote in a statement (full text below) that was sent earlier this week to Breeze ownership. The boycott is a significant blow to the Breeze organization. While only three active Breeze players signed the initial AUDL boycott last winter — Alan Kolick, Markham Shofner, and Joe Freund — nearly half of last year’s roster has now said they will not play for or support the team in 2019. Additionally, nearly the entire Gender Equity Committee that was formed last year has said they will boycott. “Running a franchise of a sports league still in its infancy is no easy task, and I understood from the beginning that the Breeze and the AUDL were juggling what they saw (and still see) as competing priorities,” said Becca Arbacher, a Gender Equity Committee member, in a personal statement (full text below). “I hoped that the formation of the Equity Committee was a signal from leadership that the Breeze was committed to improving opportunities for women in ultimate and their own relationship with the DC ultimate community. I was careful to remain realistic about the sometimes slow nature of progress, and was excited to work with the Breeze to find creative ways to maximize the impact of limited resources. DC Breeze management and the AUDL both declined to comment. The statement below specifies that the timing of their announcement is intended to affect the annual AUDL owners’ meeting, which is set for next weekend. “We wish to give the AUDL and the individual owners an opportunity to take action and create a plan for a more equitable vision of professional ultimate,” it states. Coming on the heels of the AUDL’s $500,000 Series B fundraise, this new chapter in the story of the ongoing AUDL boycott sets the stage for what is likely to be another contentious offseason. The full text of the statement, the signatories, and some personal statements are presented below. Over the past ten months of working within the AUDL structure, league officials and owners have shown at both the local and league level that the AUDL was not interested in making gender equity a priority in 2018. Our belief remains that both women and men should have equal representation at the highest and most visible levels of competition within the sport of ultimate – including professional leagues. In the coming 2019 season, if the AUDL does not make this vision a reality, we will not support the league. This means that we will not play in, attend, watch, or follow the games. The timing of this statement is intentional. In early October, the owners of AUDL teams convene for their annual meeting to discuss plans for the upcoming season. With this letter, we wish to give the AUDL and the individual owners an opportunity to take action and create a plan for a more equitable vision of professional ultimate. As players/fans who have experienced/witnessed the benefits from professional ultimate, we want professional ultimate to continue, but only if its benefits are shared equitably across genders. Proposals exist that would expand women’s access to professional ultimate including, but not limited to, a women’s league, a mixed league or a league that adheres to Ariel Jackson’s alternating gender format. Organizations and companies demonstrate priorities through their allocation of finite resources. The Breeze and AUDL have an opportunity to change course this offseason and make gender equity a priority. I recognize that change takes time. My issue with the AUDL is not that the league is not fully equitable by 2019, it is that the AUDL did not even follow through on the few promises that it did make to work toward equity. This failure to deliver is evidence that the AUDL is more interested in getting boycotters and protesters off their back than actually working toward an equitable organization. Now they are being held accountable. It makes me very sad to say, but until the league puts its money where its mouth is, I am unable to support the AUDL. Running a franchise of a sports league still in its infancy is no easy task, and I understood from the beginning that the Breeze and the AUDL were juggling what they saw (and still see) as competing priorities. I hoped that the formation of the Equity Committee was a signal from leadership that the Breeze was committed to improving opportunities for women in Ultimate and their own relationship with the DC Ultimate community. I was careful to remain realistic about the sometimes slow nature of progress, and was excited to work with the Breeze to find creative ways to maximize the impact of limited resources. As the season wore on, it became apparent to me that, while the Breeze and the AUDL may certainly believe in the principle of equity (or they may not), the team and the league were not prepared the make the adjustments necessary to bring about any kind of meaningful change. I was disappointed that such a powerful platform was being squandered, and that even when plans came to fruition, the results were merely one-off events that did not represent sustainable progress. I absolutely understand the business challenges of growing the league and ensuring solvency, but the chosen approaches of the Breeze and the AUDL make it clear that they do not see equity as key to the success of professional Ultimate and are not willing prioritize an issue they deem non-essential. The Breeze and the AUDL obviously have the right to make whatever choices they think are in the best interests of their stakeholders. That said, it has become clear to me that I no longer align with leadership’s perspectives, both in the practical sense of how to ensure the success of the league and in the ideological sense of what is right for the sport of Ultimate. It seems disingenuous on my part to continue to be a part of an Equity Committee that I see as all form and no substance, and so I think my time can be used more effectively working toward equity efforts outside the confines of the Breeze organization. Before the AUDL boycott last year, I had not put much thought into the AUDL or gender equity in ultimate. As a male-identifying player in the world of sports, I rarely have to think about my gender. I read through the boycotters’ statement, and their message immediately resonated with me. After seeking additional opinions about gender equity from women and men inside and outside of the ultimate community, I signed the boycott. I was not planning on taking part in tryouts until members of the Breeze reached out and invited me to the last round of tryouts. After a weekend of tryouts, my views on the Breeze and the AUDL were validated by the uneasiness I felt whenever I thought about the possibility of playing in the AUDL. This lead me to initially decline the spot I earned on the team. AUDL. With this thought in mind, I signed with the Breeze and was disappointed throughout the season with the lack of effort the Breeze and the AUDL took in working towards more equitable opportunities for female-identifying players in the ultimate community. I am grateful for the opportunity to play in the AUDL. My mother was able to cheer me on surrounded by hundreds of other fans. My father was able to watch my games on television. The AUDL was a large reason why I was able to ascend to the highest levels of ultimate after being a relatively unknown player. However, until my female-identifying counterparts have equitable opportunities to enjoy the same privileges, I will no longer take part in the Breeze or the AUDL. I am a member of the boycott protesting the AUDL and recognize its hold as a cultural hegemon within our albeit small community. I find the playing opportunities afforded to players within this league to be unnecessarily limiting. To divide the already small talent pool in ultimate by limiting female identifying players’ participation is not only morally abject, but creates a lesser product and alienates a substantial portion of Ultimate media consumers. Many of the sport’s best throwers and innovators are women who are put out by the rostering choices of the AUDL. As such, until I can play among our female peers who unequivocally stand at the top of our sport – my boycott will continue. My understanding was that the Breeze would put a lot of effort into creating opportunities for women and really embrace the gender equity movement. That’s why we started the committee, I believed we had the right people and support to truly work from the inside. However things changed and it felt like the more we pushed for change the more excuses were made for why we couldn’t move forward with our efforts. Bottom line is I felt they said what they needed to get the GE target off their backs and get certain players to sign. It became more apparent that the Breeze’s main interest was always their on field product and not really being on the side of change. The mixed game in Pittsburgh was an amazing experience for me. I have been blessed to play pro for 6 years and only became a better player because of the opportunity that I got from it. The excitement I got from playing in front of people was uplifting. In that mixed game I saw that same joy on each of those women’s faces. I wanted that feeling to continue for them. I remember asking myself, “Why can’t the women have this same experience that I get every week?” But the sad realization hit me after the game, the whole thing was for show. It just felt like a box that was being checked off to say “Hey look how equitable we are”.. Is it really equitable if you aren’t willing to pay the women who were a part of the game? The work “The Breeze” did towards gender equity was because of the people on the Equity Committee. I really hoped things would have panned out how we envisioned. Maybe they address this in the off season maybe they won’t, but I have no problem separating myself from the AUDL until they do. Across the country there have been official and unofficial groups of local non-male players working with their city’s AUDL teams. My experience on the DC Breeze’s Equity Committee, though peppered with a few forward strides (e.g. equity player training, pro mixed game), was hampered by dead ends that arose from systemic problems. The AUDL and Breeze operate in a system that is inherently centralized in one form of power and one type of vision, with embedded incentives that currently run counter to meaningful inclusion and equity. I am grateful for organizers within the ultimate community who strive to change this, but in DC the “official” group tasked with furthering equity within the AUDL proved powerless to affect the changes we had sought. In January 2018, I became a part of the DC Breeze Equity Committee. Promotion of change from within the organization felt like a necessary companion to playing in 2018. In its nascent stages, the committee felt energized and connected, looking to build out infrastructure for professional playing opportunities for women while also helping the Breeze explore other avenues to foster equity in the DC community. As I continued on the committee, I began to see a disconnect between the Breeze’s stated stances on equity and their actions. On the committee, I heard about the financial constraints for women professional opportunities, but then saw the Breeze spend money for additional hotels on a Canada road trip or a $1,000 prize for a throwing contest. I read Breeze tweets about the professional mixed game vs. Pittsburgh but knew the Breeze were not paying the players. There were foreseeable logistical, financial, and legal constraints in their abilities to abet the programming we were hoping to create, but I was unprepared for the lack of flexibility, creativity, and sense of urgency around equity. The creative and collaborative energy of the committee was sapped by the Breeze. Feeling stymied at the local level, I looked to the league’s response to the boycotters’ demand for gender equity. Steve Gordon released a letter to the players on December 10, 2017 outlining three major pillars of action: a digital campaign, youth development, and partnership with the Eurostars tour. I researched and searched on the web to assess the progress of these plans. From my research, the AUDL didn’t accomplish the first two to the degree promised, but was able to sponsor the Eurostars. So 1 for 3. On their own planned actions. Based on these experiences and results, I now believe that I can accomplish more for gender equity by sharing my experience and continuing to work with the DC community outside of the Breeze infrastructure to further gender equity. Comments on "DC Breeze Players, G.E. Committee Members Announce Boycott For 2019"